Bangalore is city of gardens and lakes as well as of enchanting historical buildings, captivating temples and museums. A tour to Bangalore present its visitors with many interesting choices to keep themselves entertained. There are many places to see in Bangalore, each promising a unique enriching experience. Tourists can also find equally amazing list of sightseeing places within a distance of 30-40 km from Bangalore. 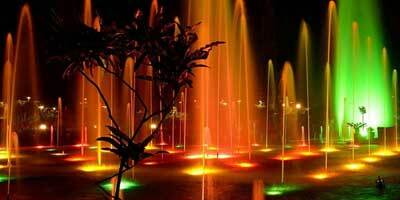 Some of the popular sightseeing places in Bangalore are listed below. Also known as Bowring’s Attara Kacheri or Old Public Office, Attara Kacheri literally means eighteen offices. Built in 1868, this architecturally magnificent building was turned into a high court in the year of 1956. Located near Cubbon Park, this building is a favourite among photographers owing to its massive red structure, captivating exteriors and intricate interiors. Earlier known with the name of Rose and Cypress Garden, Lalbagh Botanical Garden is one of the most popular tourist attractions in Bangalore. dream work of Hyder Ali, construction of this garden was completed during the reign of Tipu Sultan. Boasting of more than 1000 varied species of flora including flowers, tropical plants and herbs, this garden has a number of other attractions as well such as Glass House, Museum, Pigeon House, Statue of Sri Chamaraja Wodeyar,Kempegowda Tower, etc. Being one of the largest legislature building in India, Vidhana Soudha has an imposing building with more than 300 rooms which is spread over 550505 sq ft of area. 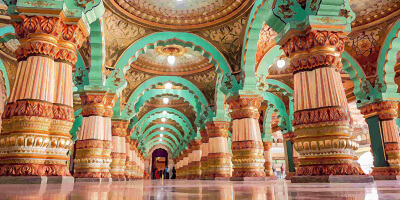 Built with Bangalore Granite in the Dravidian style of architecture, this mesmerising building was built in 1956 by late Sri K Hanumanthaiah, the then Chief Minister of Mysore State (1951 to 1956). It is lighted every evening from 6PM to 8.30 PM. the sight is worth viewing. Next to Vidhana Soudha is Vikasa Soudha, standing majestically. Spread over 8 acres of land, this building with more than 360 rooms presents an impressive view, similar to that of Vidhana Soudha. Popularly referred as ‘Sister of Vidhana Soudha’, this magnificent structure of granite was inaugurated in 2004 by the then the Karnataka Governor, T.N. Chaturvedi. Built by Mallabairegowda of Avati clan in 1501, Devanahalli Fort is located around 35 km away from Bangalore city. This fort saw many reigns over a span of many decades. in 1747, It was conquered by Dalawai, Nanjarajaiah in 1747, then by Marathas and then later came under Hyder Ali which was again transferred to Tipu Sultan. The present structure of this fort was built during Hyder Ali rule. This fort also has many temples, namely Venugopalaswamy temple, Chandramouleshwara Temple, Siddalingeshwara temple and Nanjundeshwara temple. It's amazing structure and historically association is worth exploring. Built in the year 1864 by the then viceroy of India, Sir Mark Cubbon, this park enjoys an ideal location with many popular sightseeing places located in its proximity. Initially named as Meade’s Park after John Meade, this park was later renamed as Sri Chamarajendra Park in 1927 in the honor of Mysore King Sri Krishnaraja Wodeyar. However, it is popularly known as Cubbon Park. With more than 600 different kinds of flora, mesmerising landscapes and vast open spaces, this park is frequented to experience the serenity of nature. Located in Palace Gardens, this palace was built in 1887 during the reign of Wodeyar Dynasty. 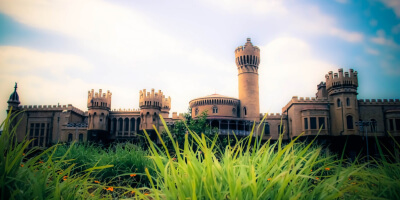 Built in the Tudor-style architecture, this palace mesmerizes everyone with its captivating architecture comprising of intricate wooden carvings, lush green gardens, gothic windows, fortified towers, etc. Bangalore Palace show resembles the palaces of England to an extent. Presently this palace is used for organising various events and programs. One of the oldest and the most popular temples of Bangalore, Bull temple is dedicated to Nandi, the ride of Lord Shiva. The main attraction of this temple is the magnificent statue of Nandi with a height of 4.5 meter and width of around 6 meters. The statue has been carved out of a single granite rock. Constructed in the Dravidian style of architecture, this temple was built by KempeGowda I, founder of Bangalore. It is also said that this statue grew in size and to stop its further growing a small iron plate has been kept on the head of Nandi. Initially built as small chapel in 1818, St. Mary’s Basilica underwent many changes. Its captivating gothic carvings were added later during renovations while in 1882 stained glass windows were added to it and then again in 9147 it was again renovated. In 1973, the statue of Basilica was brought to this Church. It is known for its architecture as well as religious significance. Spread over 21 acres of area, Freedom Park was originally a central jail which used for jailing those against British rule. During the period of emergency, many national political leaders had also stayed in this jail. It was later inaugurated as Freedom Park, symbolic of the freedom struggle during the colonial period. Sculpture court, People Courtyard, Water Fountain, Book Museum and Jail Museum are a few of its sections to see. Popularly known as Gavipuram Cave Temple, this temple is dedicated to Lord Shiva and is being protected under the Karnataka Ancient and Historical Monuments, and Archaeological Sites and Remains Act 1961. Built in the 6th Century, this temple is known for its beautiful architecture, which has been carved out of a rock which is further enhanced with the granite pillars at its front This rock-cut temple was restored and renovated during 16th century by Kempegowda I, who is known as the founder of Bangalore. Situated in Basavanagudi, this temple is one of the most popular temples in Bangalore. Known for its huge idol of Lord Ganesha which has a height of 18 feet and width of 16 feet. The statue of Lord Ganesha has been carved out of a single stone and is believed to have grown to this size. Constructed by founder of Bangalore, Kempegowda I, this temple is also called Shakthi Ganapathi and Satya Ganapthi. Built in 1812, St. Mark's Cathedral has been named after St. Mark who is believed to be one of the 12 disciples of Jesus Christ. The architecture of this church is similar to that of St. Paul’s Cathedral which was constructed in 17th Century. Exquisite wood work and intricate carvings add on to the overall beauty of the church. Built in 1882, by Col. Richard Hieram Sankey, Sankey Tank is a popular places to hangout in Bangalore. This lake is spread over 37.5 acres of area. Initially built for to serve as a water source, this lake is now popular for recreational activities such as boating. it is located in the western Bangalore, close to Vyalikaval, Malleshwaram and Sadashivanagar. With more than 600 paintings, Venkatappa Art Gallery is place not to be missed by any art lover. named after the great painter Venkatappa, this art gallery is located close to Vishweshwaraiah Museum. This gallery is consisted of works of many great artists including those of M F Hussain, Yusuf Arakkal, N S Bendrem, Hariram, Hanumiah and Venkatappa as well. Located by the side of Nagawara Lake, Lumbini Gardens presents a perfect place for spending some time with your friends and family. Bestowed with beautiful natural settings, it also offers a wide array of waterfront activities. There are also facilities of boating here. Built in 1557, it was initially built by Kempegowda I, the founder of Bangalore. However, it later came under Tipu Sultan who extended this fort.. However, later after the British conquest, this fort was destroyed partially which went till 1930s. Presently one can see Delhi Gate, and remains of 2 bastions. Summer Palace of Tipu Sultan is also located inside this fort vicinity. In Bidali, off the Bangalore-Mysore Highway, Innovative Film city is an entertainment hub with entertaining choices for each and everyone. It has a wide array of interesting sections, each promising a unique and fun-filled experience. Miniature city, replicas of the popular wonders from all over the world, museum, haunted mansion, wax museum, Dinosaur World, Fossil Hunt, water rides, etc are a few of the engaging sections of the Innovative film city. At a distance of around 40 km from bangalore city, Manchanabele Dam is constructed over Arkavathi River. This place presents captivating scenic beauty. it is also popular among bird watchers. Along with boating, it is also known for its trekking trails. At a distance of about 45 km from Bangalore city, Thippagondanahalli Reservoir presents mesmerising natural beauty. Built at the confluence of the Arkavathy River and Kumudvathi River, this reservoir is an ideal place to visit if you are looking for a small break amid nature. It was inaugurated in 1933. Often referred as Bangalore Ashram, Art of Living International Center is located about 21 km south of Bangalore. Built over a hillock, the AOL ashram Bangalore was built in 1986 over 65 acres of land. With captivating landscapes, lush green and vast open grounds, this palace is visited by not only by devotees and followers but also by nature lovers. Along with spiritual environment and natural surroundings, there are also various Ayurveda centers here. This ashram also attract visitors with its alluring architecture. A man-made lake, Hesaraghatta Lake is situated around 18 km north west of Bangalore. Built in 1894, across Arkavathy River, this lake was initially constructed as a water source. Now popular as a picnic spot, this lake is also frequented by bird watchers. It is located close to other tourist attractions such as Government Aquarium, Nrityagram which is a known he dance village. One of the biggest water parks India, Wonder La Amusement Park is a place for everyone. This entertainment park promising fulfilled experience to everyone with its innumerable options of dry rides and water sports. Located around 28 km away from Bangalore, this amusement park spread across 82 acres of land can be explored through our 1 day Wonderla Bangalore Package. WonderLa presents international standards of facilities and an extensive variety of ids’ rides, dry rides, high thrill rides, and water rides and sports. Used a summer retreat by Tipu Sultan, this palace was constructed by Tipu Sultan in 1791. The construction however was started by Hyder Ali in 1781. one of the major attraction of palace is the museum which has various things related to Tipu Sultan and Hyder Ali on display such as his crown, clothes, silver vessel, etc. About 58 km away from Bangalore, Shivagange is near the town of Tumkur (8km). A popular pilgrimage, this is also visited by tourists because of its breathtaking scenic beauty. this mountain peak which resembles Shivalingam is visited by many devotees. There is also a holy spring near by. Some of the popular religious sites located here are Gangadhareshwara temple, Olakal Teertha, Nandi Statue and Patala Gange. Popularly known as TK Falls or Swarna Mukhi falls, it is located about 35 km away from Bangalore. This fall is popular for its mesmerising natural beauty as well as for its religious associations. it is often visited by those who seek adventure. it is known for trekking and walks. Ulsoor Lake, ISCKON Temple, Laser Republic, Government Museum, HAL Aerospace Museum, Jawaharlal Nehru Planetarium are a few other popular tourist attractions in Bangalore.